In brief: The area of upper Bavaria between Munich and the Bavarian Alps is famous for its unique countryside: a mix of farmland, crystal-clear waters and lush alpine scenery. On this cycling holidays you will get to enjoy the countryside and learn about the local traditions and beliefs. 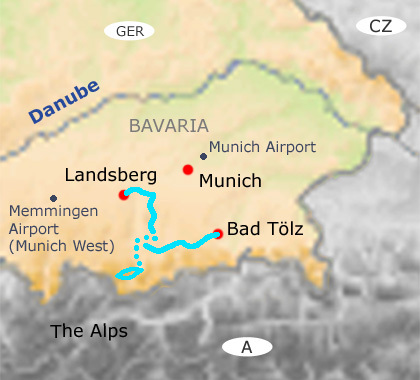 On our way from Landsberg to Bad Tolz we pass places that are well known beyond the borders of Bavaria: Oberammergau and its tradition of Passion Plays and Linderhof Palace, where King Ludwig II lived secludedly for many years before his life ended mysteriously. We will cycle upper Bavaria on dedicated cycle paths and quiet back roads. Upper Bavaria awaits your arrival!